The RAV KPH370.42 Two Post Lift is the only 10,000 lb lift on the market with double wall column construction. Each column is constructed with 20 strength increasing bends making it the strongest column on the market. 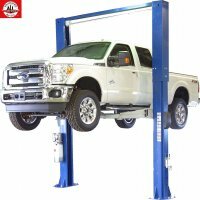 Heavy built commercial grade 2 post lift with smooth operating controls. Superb finish, function and fit throughout the whole product. 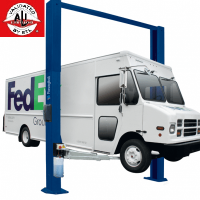 Highest manufacturing methods applied to produce this most capable 2 post above ground lift. Standard in this version with 3-stage short arms and 2-stage long arms provide asymmetric and symmetric lifting of cars, trucks, SUVs and vans. 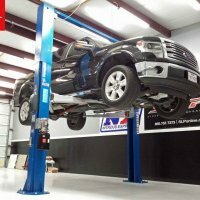 The same lift is available with 4 three stage arms and 13.5' tall. The self-controlled lowering speed avoids a rapid decent. Mechanical safety latches automatically engage to ensure maximum safety when lift is in raised position. Automatic arm locking during lifting and automatic unlocking when the arm reaches the floor. Self-locking conical design. Very low pad of less than 4", adjustable in height.